James T. Moses, 90 of Goliad died on June 3, 2016 in San Antonio surrounded by his family. He was the son of James Lee and Annie Catherine (Brawley) Moses. He was born in Floydada, TX on April 28, 1926. He is survived by: his wife of 66 years, Grace E. Moses, a son, James R. Moses (Cherie) and a daughter Rebecca J. Smith (Tommy), three grandchildren, Michelle Smith, Walt Smith (Nikki) and Justin Moses (Carla), and three great grandchildren, Starlie, Peter and Malin. Survivors also include one brother, Billy Jean Moses (Alene) one sister, Betty Bax and numerous brother and sister in laws who loved him like a brother. James was a veteran, having fought in World War II in the Navy aboard the USS Bladen. 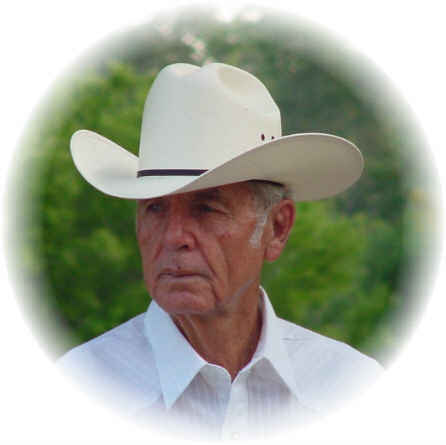 He was also a River Rider for the Tick Force, riding many hours along the U.S./Mexico Border, an Investigator for USDA/APHIS, a cattleman and a loving father and grandfather. He was a proud member of the Goliad Church of Christ. Services will take place on Wednesday June, 8th 2016 at the Goliad Funeral home at 10:00 am. Burial will follow at the Glendale Cemetery in Goliad, TX. In lieu of flowers, the family asks that donations be made to Sunny Glen Children’s Home in San Benito, TX.